- "There is a cosmology of the Old Testament. When the Old Testament talks about the firmament, this is Babylonian cosmology. In that period the people of the Middle East observed that, when they dug a well, they found water underground. They saw rain falling from the sky, and often there were floods. If you read the Psalms carefully you will see that there are storehouses up in the sky. You open the door, as in a shower, and water falls down. Therefore the way they imagined creation was that in the beginning God created the firmament. The earth was in the middle of the waters and afterwards He suspended the firmament, to support the waters above it, and we have the earth to retain the water below. We are in the middle and live between the waters. This is the cosmology of the Old Testament. Does it bear any relation to reality?" - "The cosmology of Genesis shows amazing similarities when compared with Babylonian cosmology. Then there is the chronology of the creation of the world. If we take the Old Testament and reckon when the world was made and when man appeared on earth, we cannot get further than about 6,000 to 6,500 years. We now know that the universe is much older than 6,500 years, because a few months ago a new star was found that was fifteen billion light-years away from the earth. Our sun is about ninety-four million miles away and it takes about seven minutes for a photon to reach the earth from the sun. A light-year is the distance a photon of light travels in a year. If the sun is ninety-four million miles away, imagine the distance that a light-year represents. So if we put in fifteen billion light-years, even the computer will have difficulty calculating the numbers involved. In any case, we know that world is at least fifteen billion years old. This means that Holy Scripture is completely out as regards the chronology of the universe. The other strange thing is that we do not know what lies beyond. This is what they have found at present, but in a year's time they may find something that is twenty million light years away, and so on. We do not know how these heavenly bodies originated, or even if they still exist, because the light now arriving started its journey fifteen billion years ago in order to reach the earth. So the distances that exist now in astronomy are amazing. Thus from the scientific point of view Holy Scripture seems short of information and does not enlighten us much about the composition of the universe as a whole." - "In the Middle Ages the Europeans had a geocentric perception of the universe. The earth was the centre of the universe and everything revolved around the earth. In the modern era the first astronomers, Galileo in particular, came along and demonstrated with telescopes that instead of the sun revolving around the earth, the earth revolves around the sun. He proved this by observation, not philosophy. The observations were made with the first telescopes, which he constructed himself. His observation was very simple: he saw that every six months the locations of the spots on the sun moved from one edge of the sun to the other. 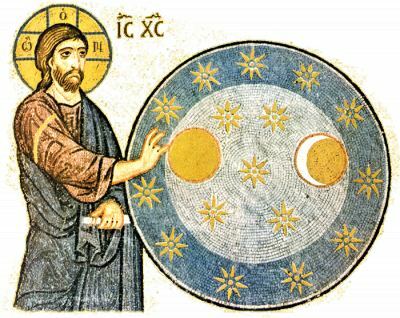 He put forward his theories about the sun and the heliocentric system, in contrast to the geocentric system. At that time the rulers and authorities were not convinced, even though bishops looked through his telescope and he explained what his observations meant. In spite of this, he was nearly burnt as a heretic because his theories raised the issue of heresy, and he himself retracted them to show his repentance, in order to avoid execution. From then onwards the suspicion arose that familiar things in the natural world were not as the theologians described them, but that it could be proved through more careful observation, aided by equipment that man is capable of constructing, that the world was different and could be differently described. We know that the earth is spherical and not a flat slab, which was an opinion that existed in Alexandria but had been forgotten." - "Quantum mechanics finally destroyed the meaning of pure mathematics and it is obvious that no trace remains of the existence of anything immutable in the world. Everything is in continuous motion and no one can trace out beforehand exactly how an electron inside an atom will function. The electron is no longer predestined by the theory of Max Planck. This has been proved now by experiments. Because of this an Anglican bishop said, 'If we reduce human knowledge to electric pulsations and so on, then it is no longer knowledge.' Really? Why is it no longer knowledge? This is what he asserted, because he wanted to support an older anthropology belonging to his own tradition. I answered, 'That is not a problem for us Orthodox. It is not at all difficult for me to accept that knowledge is like that, with electric pulsation.' I also told him: 'With your way of thinking, if the proof of immortality and eternal existence of the soul is mathematics, then with that argument we shall prove that even electronic brains are immortal. They solve the most difficult mathematical problems and much faster than the human mind. As we have taught machines to think, it means that epistemology is not basically the key to the universe.'" - "I remember that once I was in Geneva and there was a Greek, a specialist in quantum mechanics, who met me in church and invited me to his house, together with a professor of astronomy from Greece. Afterwards I said that quantum mechanics clearly tells us today that there is nothing immutable, because it has been shown that mathematics itself is an estimate, so we always say 'approximately'. Every measurement is an approximate measurement. We measure either the momentum approximately, or the position approximately. And best of all, whereas Einstein thought that electrons had an unchanging movement within the atom, it is now proved that the things jump around. So no one can precisely calculate their course mathematically. All calculations by contemporary physicists and so on are done 'approximately'." - "I went to a baptism of a member of the aristocracy, in an aristocratic family in England. The present Archbishop of Canterbury took us with him to a baptism that a team was going to perform. There was a large reception. The father of the girl must have been one of the most important astronomers in England. We had a discussion in the lounge. And he, poor man, had suffered a phobia about what the future of the world would be. We had a discussion. What was he afraid of? Now they have found black holes in galaxies, the earth has cracks, so to speak, and the moon - I don't know exactly - is opening up, doing something or other - whereas before we believed in a harmonious universe and we had the harmony of the universe as one of the great arguments for the existence of God. Now we have arguments instead for the non-existence of God, because there is no harmony in the universe. There is serious discord in the universe and it seems as if everything is heading for catastrophe." - "The aim of divinely inspired concepts is not to reveal anything about the essence of created things and the universe. The whole subject of the positive sciences is related to theology, but theology does not throw light on those other subjects." - "The purpose of the concepts of Holy Scripture is purely ascetic, not scientific. It is not that we should track down from the concepts what matter and the heavenly bodies consist of, and how the structure of the universe functions. This is not the aim of these concepts. The aim of these concepts is to lead us through asceticism to God: by means of purification and illumination to lead us to glorification. 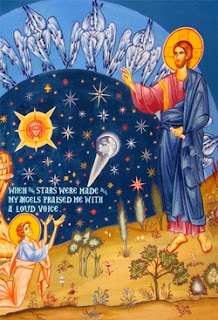 Apart from that, these concepts also aim to make clear to us the relationship between uncreated and created things, so that we know that what is uncreated is from nothing, because the Father is from nothing, the Son is from the Father, the Holy Spirit is from the Father, and the divine energies are from the Father through the Son in the Holy Spirit. These are uncreated. And then there is the relationship between the created and the uncreated. Created things are from nothing. The Fathers know about the relationship between the 'created' and 'uncreated' from their experience of glorification. They not only know about the existence of created and uncreated things but about how they interrelate. This does not mean, however, that they know and learn about the essence of God or even about the essence of creatures."